“The Matrix” demonstrates moves from the early 2000's that is fast and exciting. “Flow” is described in the bonus feature as a way of expressing the acquired knowledge of moves into technical dance routine. 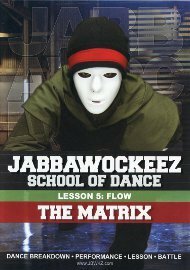 Jabbawockeez is an exhilarating male, hip-hop dance crew best known for winning season one of America's Best Dance Crew. Recognizable for always perform wearing white masks and white gloves.